Reality television is embedded in our popular culture. We see the shows, we follow the so-called “stars” on social media, we hunt online for live feeds or message boards about our favorites, we see the scandals in the tabloids and we guiltily profess our affinity to one show or another. Reality television has a dominant presence in popular culture today. Due to the success of Survivor: Borneo in the summer of 2000, we have seen a proliferation of reality programming. After 13 years and 26 seasons, Survivor continues to garner impressive ratings for CBS. The popularity and endurance of this program makes it important to understand exactly what is being presented to viewers. Gender identity is a particularly salient issue when it comes to representation in popular culture. Survivor offers a prime location for the exploration of perceptions of contestants’ gender identity. 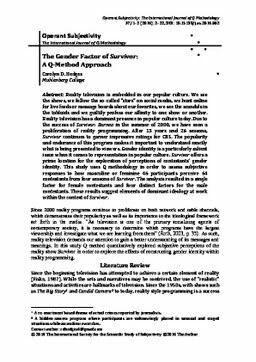 This study uses Q methodology in order to assess subjective responses to how masculine or feminine 46 participants perceive 64 contestants from four seasons of Survivor. The analysis resulted in a single factor for female contestants and four distinct factors for the male contestants. These results suggest elements of dominant ideology at work within the context of Survivor.